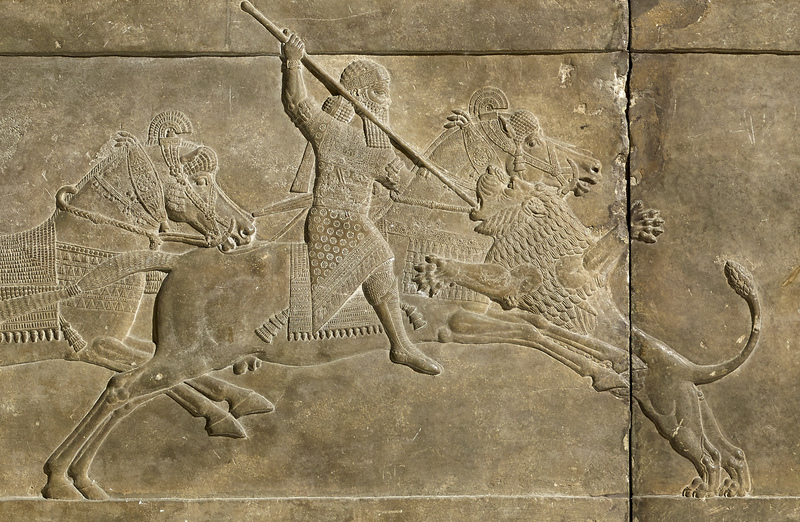 Relief of Ashurbanipal hunting on horseback. Nineveh, Assyria, 645–635 BC. Ashurbanipal wasn’t modest about being the king of the Assyrian empire – he called himself ‘king of the world’! Quite a claim, but given the size of the empire, it wasn’t far from the truth. Stele depicting Ashurbanipal (right) and his brother Shamash-shum-ukin (left). 668 – 655 BC. Despite being one of Assyria’s greatest kings, Ashurbanipal wasn’t destined for the throne, as he was a younger son of the king. When his eldest brother and the heir to the throne died, his father Esarhaddon passed over the next eldest son Shamash-shum-ukin, and made Ashurbanipal crown prince instead. This was a bold (and perhaps a slightly foolish) move. Esarhaddon’s own father had been brutally murdered by his sons after he put their younger sibling (i.e. Esarhaddon) on the throne! Shamash-shum-ukin, would have been pretty annoyed about the decision to bypass him. As a consolation, Esarhaddon made Shamash-shum-ukin king of Babylon. That doesn’t sound so bad, right? Well, not quite. At this time, Babylon was part of the Assyrian empire so he would essentially have to answer to his younger brother! Tensions would later explode into all-out war. At the command of the great gods, [my father] greatly preferred me over the assembly of my elder brothers. When Ashurbanipal was appointed crown prince, he started his training to be king. He learnt royal etiquette, important military skills and was instructed in scholarship. He shadowed his father in court where he could learn the way of Assyrian kingship. He also worked as a spymaster for his father, gathering information from agents across the empire and compiling intelligence reports. This helped to develop Ashurbanipal’s knowledge of the empire – and learn who his potential enemies were. Frederick Arthur Bridgman (1847–1928), The Diversion of an Assyrian King. Oil on canvas, 1878. As part of his military training, the young crown prince was taught to drive chariots, ride cavalry horses, and develop skills such as archery. He also learnt how to hunt lions. In Assyria lion hunting was a royal ‘sport’. Although this perhaps seems cruel to modern eyes, killing lions represented the king’s ability to protect his nation against all that was wild and dangerous in the world. I pierced the throats of raging lions, each with a single arrow. Relief depicting Ashurbanipal hunting a lion. 645 – 635 BC. 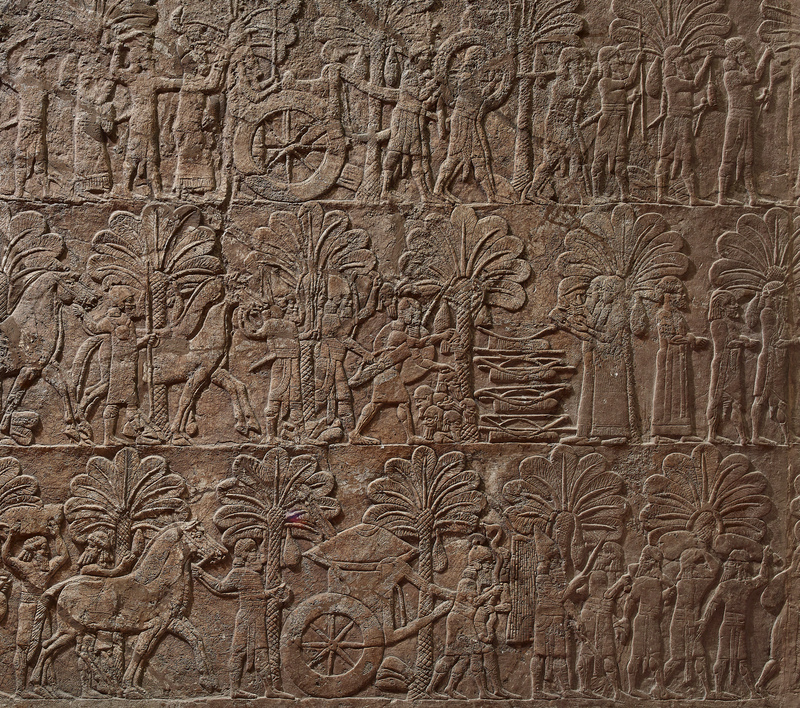 Ashurbanipal commissioned a series of reliefs – a sculptural technique where the sculpted elements remain attached to a solid background of the same material – to cover the walls of his palace which showed him hunting, and even strangling lions with his bare hands. These works are some of the most famous examples of Assyrian art. Ashurbanipal was popular among his subjects but ruthless in dealing with enemies. He was said to have put a dog chain through the jaw of a defeated king and made him live in a dog kennel. That’s pretty brutal, even by the standards of the ancient world. Ashurbanipal inherited a war with Egypt (and other neighbouring regions), which he went to work dealing with, destroying his enemies and growing the empire even further. When the state of Elam tried to rise up against Assyria, Ashurbanipal crushed them. He claimed to have killed the Elamite king and his son with his own sword (in reality, he was not at the battle, but at home in the safety of his palace). The Elamite king’s head was brought back to the palace in Nineveh where it was hung from a tree in the garden as a decoration. 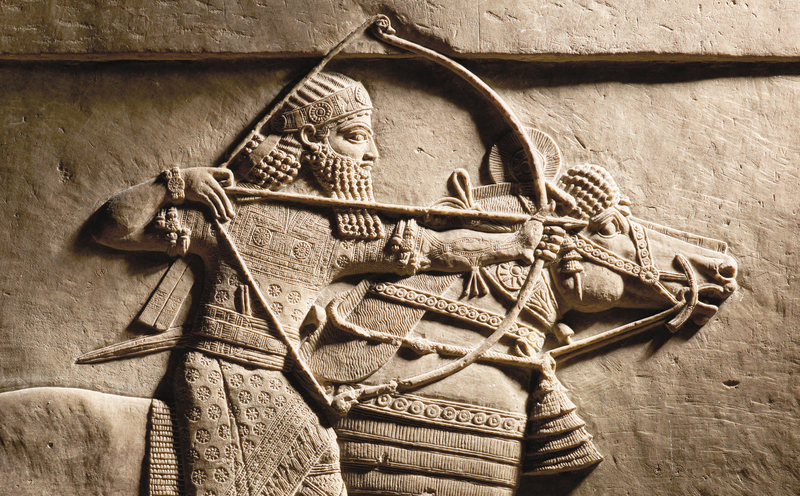 Most people would see this as a very clear warning – don’t mess with Ashurbanipal! With the help of Ashur [the patron god of Assyria] and Ishtar, I killed them. Their heads I cut off in front of each other. Relief depicting Ashurbanipal relaxing in his garden. The head of the Elamite king hangs from a tree on the far left. 645 – 635 BC. Ashurbanipal spent a lot of effort dealing with Elam’s troublesome rulers, who plotted against Assyria. The exasperated Ashurbanipal decided to crush Elam once and for all. 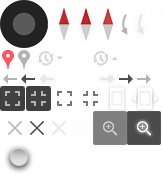 He robbed the palaces and temples and ordered that the royal tombs be opened and the bones of kings taken. Those who survived were brought back to Assyria in chains as slaves. I had the sanctuaries of the land Elam utterly destroyed and I counted its gods and its goddesses as ghosts… I destroyed and devastated the tombs of their earlier and later kings… I took their bones to Assyria. I prevented their ghosts from sleeping and deprived them of funerary-offerings and libations… On a march of one month and twenty-five days, I devastated the districts of the land Elam and scattered salt and cress over them. 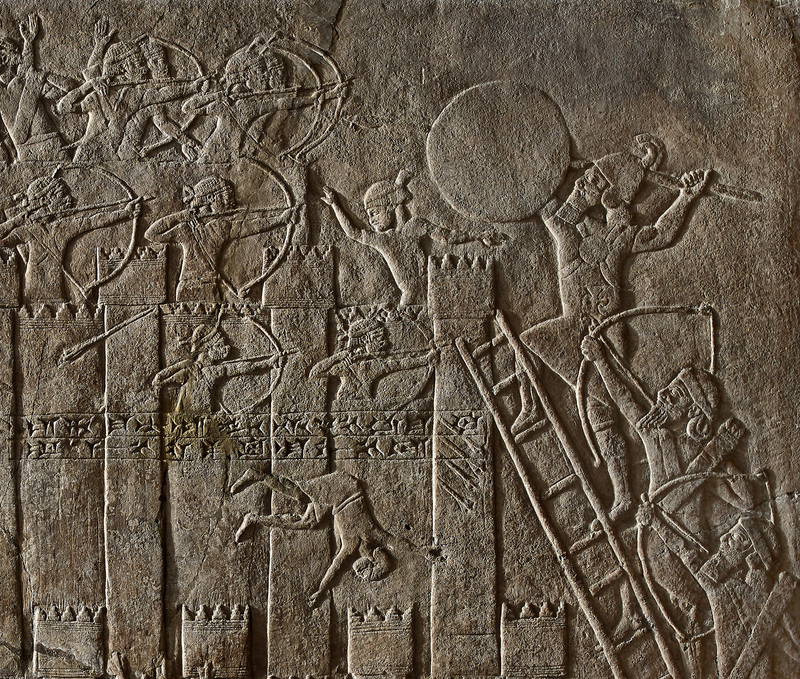 Detail of a relief showing the Assyrian siege of an Elamite fort. 645 – 635 BC. Crushing enemies was not confined to external threats – he also destroyed his own brother. As we’ve already seen, Ashurbanipal’s brother Shamash-shum-ukin had been created king of Babylon. Fed up of answering to Ashurbanipal, his brother conspired against him, creating a coalition with other outlying peoples in the empire and taking contested cities in the name of Babylon. When Ashurbanipal discovered the plot, he laid siege to Babylon for two years! There were horrific stories of people eating their own children to survive starvation. In the end Ashurbanipal’s brother died in his burning palace to escape capture and his co-conspirators were killed. As for the rest of the people, those still alive … I myself now laid flat those people there as a funerary-offering… I fed their dismembered flesh to dogs, pigs, vultures, eagles, birds of the heavens, and fish of the apsû [waters]. While he wasn’t crushing enemies and killing lions, perhaps incongruously Ashurbanipal enjoyed scholarly pursuits. He could read and write, which was unusual for a king. He loved to boast about his scholarly abilities, and he even represented himself in his palace reliefs with a stylus (used for writing) in his belt, along with his sword. The pen may be mightier than the sword, but Ashurbanipal was pretty handy with both! Ashurbanipal developed the first systematically collected and catalogued library in the world. He wanted a copy of every book worth having and sent his minions across the empire to gather all the knowledge in the world. Assyrian books were mostly written on clay tablets, not on paper, in a script called cuneiform, which used little wedges to make up symbols. In total he gathered hundreds of thousands of these tablets, around 30,000 of which are now in the British Museum. 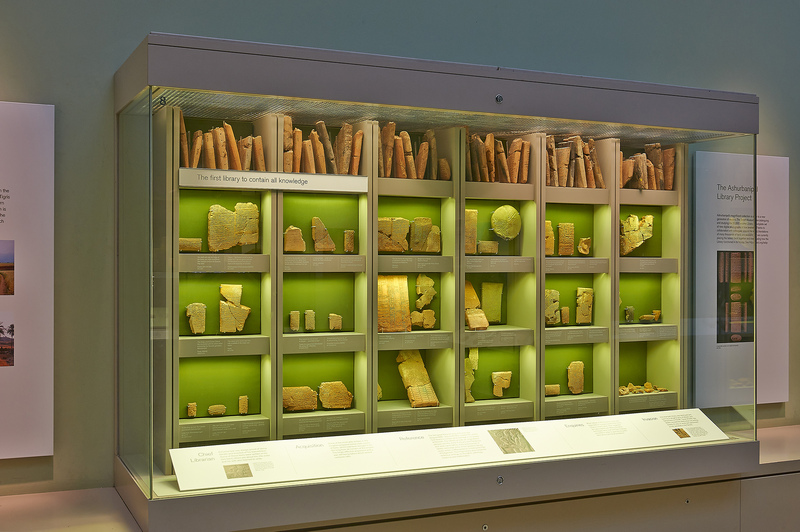 Some of the tablets from the library of Ashurbanipal at the museum. I, Ashurbanipal, learned the wisdom of Nabu [the god of writing], laid hold of scribal practices of all the experts, as many as there are, I examined their instructions. Ashurbanipal’s library was buried beneath the burning walls of his palace and was lost for over 2,000 years. The first broken and scattered remains of the library were found in 1849 and are now at the British Museum. Scholars from around the world have studied these fragments since and much of what we know about Assyrian culture comes from these texts. Fragment of a clay tablet, which tells the story of the flood from the Epic of Gilgamesh. 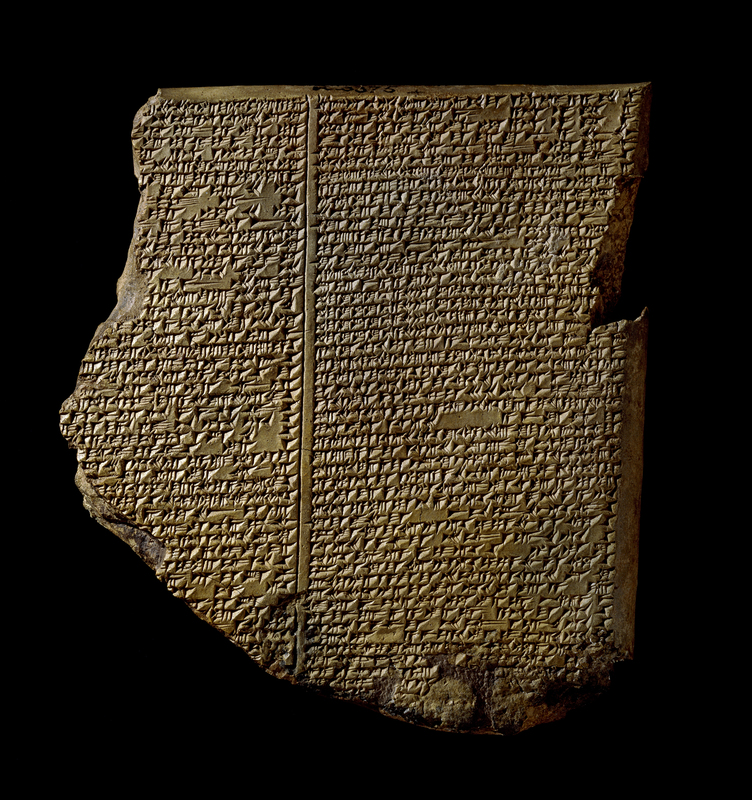 Among the works were the Epic of Gilgamesh, now considered one of the oldest works of literature in the world. Part of it was recorded on what we now call the ‘Flood Tablet’ which told the story of the Great Flood, and until that time was only known from the Bible. Illustration of Assyrian palaces from The Monuments of Nineveh by Sir Austen Henry Layard, 1853. Ashurbanipal reigned from his royal capital at Nineveh. The Assyrian kings built on a lavish scale. 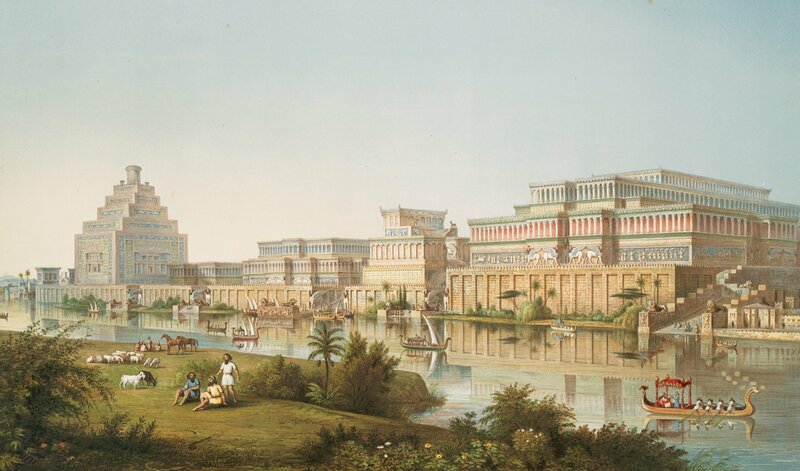 The city of Nineveh was transformed by Ashurbanipal’s grandfather, Sennacherib, into a large city whose size and splendour astonished the ancient world. Ashurbanipal ruled for most of his reign from the ‘Palace Without Rival’, which was built ‘to be an object of wonder for all the people’. Visitors entered the palace through massive gateways flanked by colossal human-headed winged bulls (known as lamassu) that protected the king from dangerous supernatural forces. 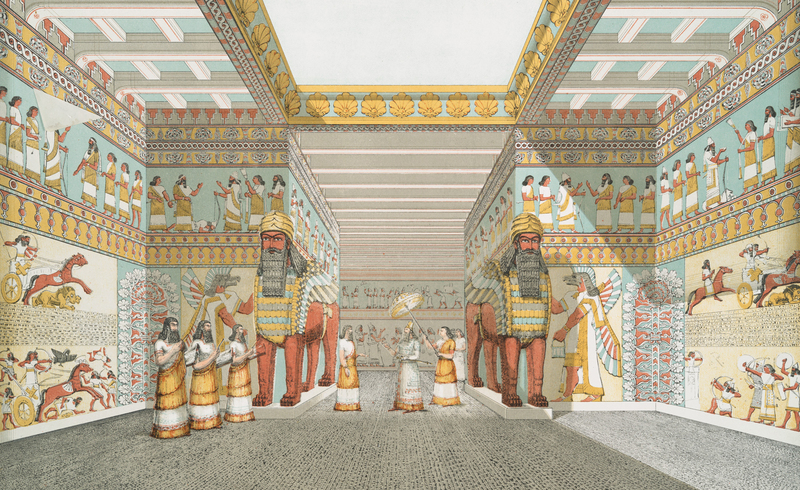 Illustration of a hall in an Assyrian palace from The Monuments of Nineveh by Sir Austen Henry Layard, 1853. Ashurbanipal’s life is well documented but his death remains a mystery. Before archaeological discoveries were made in the 19th century, Ashurbanipal was known through later writers as Sardanapalus and was romanticised as the last king of Assyria. One Persian account says that he burnt himself in his palace alongside his concubines, gold and silver, when Nineveh fell under his enemies. This was famously reimagined in Delacroix’s dramatic Orientalist painting The Death of Sardanapalus. 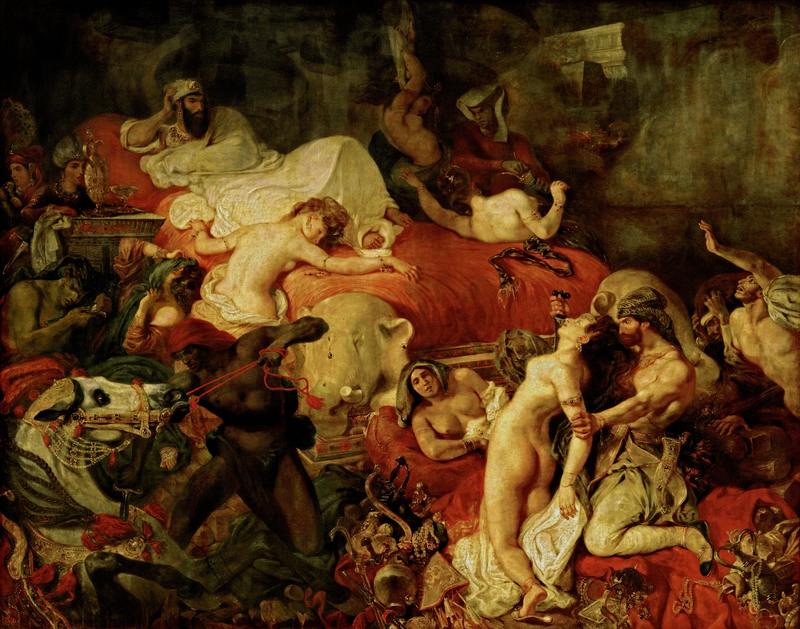 Eugène Delacroix (1798–1863), Death of Sardanapalus. Oil on canvas, 1827. Archaeological evidence has proven that Ashurbanipal wasn’t the last king of Assyria and that he didn’t die during the fall of Nineveh. However, shortly after his death, in around 612 BC, the empire weakened and various groups sacked Assyrian cities, leading to the empire’s collapse. Little is known about the kings that succeeded him so the legend of Ashurbanipal as Assyria’s last great king does have some truth to it. 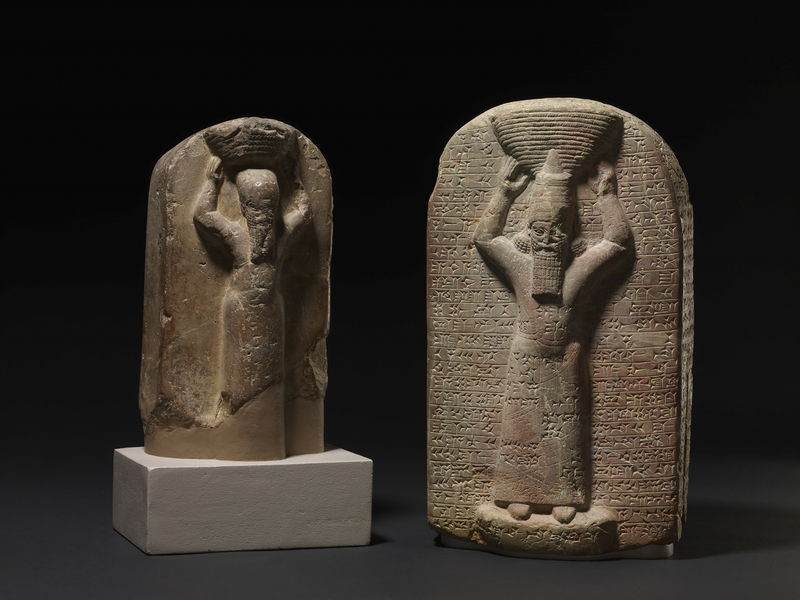 You can discover more about Ashurbanipal in the BP exhibition I am Ashurbanipal: king of the world, king of Assyria which is at the Museum from 8 November 2018 – 24 February 2019.